Plants cannot simply relocate to better surroundings when their environmental conditions are no longer suitable. Instead, they have developed sophisticated molecular adaptation mechanisms. Scientists at the Technical University Munich (TUM) in cooperation with the Helmholtz Center Munich and the University of Nottingham have been able to demonstrate that brassinosteroids, which until now have mainly been regarded as growth hormones, increase the resistance of plants against frost. “Stress caused by cold is an environmental influence which has a direct effect on the growth and yield of plants”, says plant molecular biologist Professor Brigitte Poppenberger. 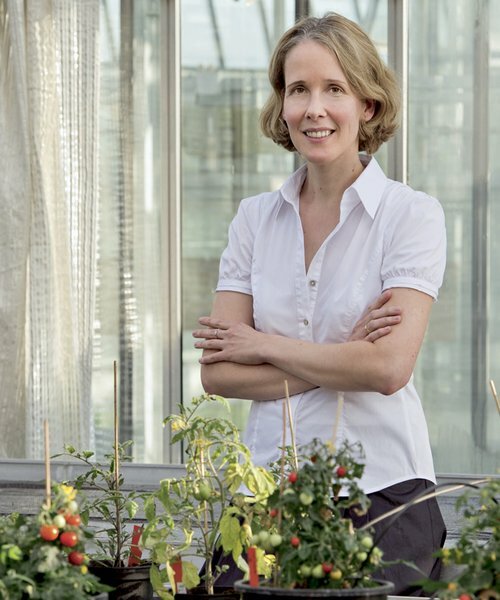 With her research group at the Biotechnology of Horticultural Crops institute at the TUM, she investigates the mechanisms used by plants to adapt to external influences. Her research activities have centered on brassinosteroids for quite some time. In earlier work, her group already used common thale cress (Arabidopsis thaliana) as a model plant to demonstrate exactly how this plant hormone, which was identified for the first time in rapeseed in 1979, promotes plant growth. In fact, it had been known for a long time that this hormone plays a role in plant development. However, the exact mechanism of action was unknown. It was the work of the biotechnology experts at the TUM School for Life Sciences in Weihenstephan that first made it possible to gain a precise understanding of this phenomenon. It’s no coincidence that Brigitte Poppenbergers team once again picked Arabidopsis for the current study. Due to its relatively undemanding nature, simple structure, and its compact size, it isn’t simply a favorite among geneticists in general–the tiny herb also provides optimal conditions under which to search for cold protection mechanisms in plants, as it’s able to survive low temperatures and increase its tolerance to frost by adapting to the cold. In the current issue of the specialist journal “Proceedings of the National Academy of Sciences” (PNAS), the scientists describe the hitherto unknown side of brassinosteroids, which up until now have been known as growth hormones. In order to gain a detailed understanding of their mechanisms, the researchers carried out experiments in which they exposed Arabidopsis plants to slowly decreasing temperatures. Experiments with wild-type varieties in the laboratory showed that as the temperature decreases, the plant reacts by beginning to modify the expression of genes for which DNA is transcribed to RNA within its cells. “This reduces its growth, which increases its chances of survival”, Poppenberger explains, describing the natural protective mechanism of the normal plants. The researchers obtained a different result with their experiments involving genetically modified model plants, which are no longer able to synthesize brassinosteroids themselves or recognize them as a signal. While wild-type varieties often still managed to survive temperatures of six degrees below zero, most of the mutants already displayed clear signs of damage at this point, which demonstrates the essential role steroid hormones play in this process. By analyzing the process, the researchers found that brassinosteroids increase frost resistance by regulating a protein called CESTA. This protein uses a signal cascade to control gene expression. In this manner, it in turn influences the protein composition of the cells, which among other things appears to lead to a change in the fatty acid composition. This ensures that the plant stocks up on a type of ‘winter fat’ on a molecular level, thereby protecting it from potential cold damage. Marina Eremina, Simon J. Unterholzner, Ajith I. Rathnayake, Marcos Castellanos, Sean T. May, Klaus F. X. Mayer, Wilfried Rozhon and Brigitte Poppenberger: Brassinosteroids participate in the control of basal and acquired freezing tolerance of plants, PNAS 2016.